The jubilant players of the Melton Mowbray CC 1st XV celebrated winning the league championship on Saturday a year after suffering the heartbreak of relegation by just a single point. Melton needed just 11 points from their final fixture at local rivals Thorpe Arnold 2nds, who were already relegated. But Thorpe were unable to field a side so Melton were handed maximum points, allowing them to pip Market Overton to the single promotion place and make an instant return to Division 3. Melton were able to put out a settled team for most of the season with two new additions in Mike Roberts and Lee Middleton and with Simon Brown also returning to the club after a couple of years out of the game. Captained by Ben Redwood, they ended 2016 with 13 wins, three draws and two defeats. With opener and top scorer from 2015, Pete Humphries injured for most of the season, Phil James stepped up to the vacant opening position and with Gary Potter they formed a strong partnership. 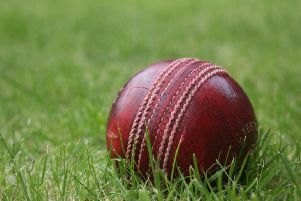 Potter was on course for 1,000 runs for the season but missed out as the last four games were lost to the weather and the forfeiture of the final match. The middle order of Lee Freer, Lee Middleton, Mike Roberts and Spencer Handley contributed valuable runs, as did the bowlers. The team were particularly strong in the field as well, with special mention to Carl Parker for the number of runs he saved throughout the season. The opening bowling partnership of Mike Roberts and Karl Tew took over 70 wickets between them and they regularly had the opposition on the back foot. These were well backed up by Paul Stevenson, James, Redwood, Middleton and Simon Brown. Over the course of the season only two teams were able to get past 150 against Melton Mowbray and in seven games the opposition were shot out for 100 or less. A number of other players, particularly Vic Musson, Mark Mabbutt, Scott Mooney and Lewis Marsh have played for the 1st XI in 2016 and their contributions have been extremely valuable. Melton Mowbray CC have organised a memorial match for former player John Taylor on Saturday. The game starts at 2pm and will be 20 overs per side. The club starts indoor nets in January 2017 for juniors and seniors - anyone interested in attending can get in touch on facebook, Twitter or via the e-mail address contact@meltoncricket.org. l A disappointing end to the premier division season for Barkby United saw them dramatically miss out on runners-up spot by being beaten in the final over by closest rivals Loughborough Town. Replying to Barkby’s 229 at Beeby Road, the visitors’ last wicket pairing required four off the final six deliveries. And Asish Trusz lofted Tom Flowers’ first ball over the ropes to confirm second spot for his side and spark wild celebrations among his team-mates. Earlier in the day, under grey skies and looking down at a fresh green pitch, Barkby captain Steve Flowers elected to bat first. But openers Aiden Morris, for a duck, and Tom Flowers were both dismissed with just 12 on the board. Skipper Steve Flowers was on the front foot from the first ball he received. He smashed 23 off one Ben Mike over to get the scoreboard moving. Jack Wilkinson struggled at the other end and he was finally out for 10, bowled by Mike, who returned figures of 3-45 from nine overs. Next in was Ian Kirk, for what could have been his final innings for the club. He showed all his trademark shots with his fast hands as he and Flowers started to put Barkby in a strong position. Kirk slapped his way to 41 with fierce shots both sides of the wicket but was disappointed to fall to the bowling of Wells after feathering one through to wicketkeeper Locke. Townsend started his knock positively, hitting two straight boundaries within his first six balls. But just as he started to look comfortbale he was run out for 13. With both batsman looking comfortable, Townsend (13) then took it upon himself to run himself out. Martin Troop joined Flowers but he also fell quickly for nine when he was bowled by the returning Mike. Flowers continued to play positively, though, hitting his favourite pull shot to great effect, and amassing an impressive 84. He was out when attempting to hit out towards the end of the innings. Bartram (16) showed maturity beyond his years to steer Barkby to full batting points as the team total reached 229 all out. Kirk made the required early breakthrough when he ran out Loughborough’s county batsman Tom Wells for five. Jack Johnson followed it up with the wickets of Anish Patel and Harry Barr to leave the visitors tottering on 21-3. Dips Patel played nicely for 25 before he was adjudged lbw to Townsend, who was to claim 4-62. Townsend grabbed a second wicket in the over when Kyle Saddington chipped him to Morris at mid off. Rishi Patel continued sweeping Townsend to the short boundary and went to a hard-hit 50 taking Loughborough beyond the half way mark. Townsend then trapped Mike (4) lbw and had Patel caught by the captain at cow corner for 51. Tom Flowers got an lbw decision against Franklin to make it 131-8. But Trusz continued to bat nicely from the other end, and finding solid support from young Khunti (10), who was out stumped with 29 runs required to win. But veteran keeper Kelvin Locke steadied the ship and Trusz, with a superb unbeaten 85 guided Loughborough to victory.